Deadly Politics by Maggie Sefton, a Mysterious Review. Review: Out of work and in need of a job, Molly Malone, the 56-year-old former wife of a U.S. Congressman, reluctantly accepts an offer to work as a managerial accountant and financial consultant for Senator Russell of Colorado. After spending so many years in the city herself, she's no fan of it or its institutions, and is especially cynical about what happens outside the public eye. But she's still shocked to discover her own niece Karen, who arranged for her to get the job, is having an affair with a high-ranking — and very married — official, Congressional Chief of Staff Jed Molinoff. It's all just another, typical day in Washington D.C. … until murder intrudes in Deadly Politics, the first mystery in this series by Maggie Sefton. Karen has been filling Molly in on the secret deals going down, including some suspicious campaign contributions from a shadowy organization called The Epsilon Group, a "think tank" that sponsors forums on international finance. Of course that is simply a grand name for a group of lobbyists, whose mission is to influence legislation from which their members can profit. But then the chairman of the banking committee dies, a natural death — or so its ruled by the authorities — giving The Epsilon Group an opportunity to influence who is selected to replace him. All this would be simply background noise to Molly, until Karen is mugged and killed. Molly suspects it may not have been a random crime, and enlists the help of an old friend in trying to determine who killed her niece. There is a fairly large cast of characters in Deadly Politics, led by the strongly developed Molly Malone. As a former insider herself, she knows what happens behind the scenes and how it happens, the men and women who use the system to their own advantage under the guise of doing the people's will. This is a fascinating novel on many levels, but is also a solidly written murder mystery/thriller. And there promises to be more of Molly Malone in the future as an ominous conversation between two of the characters, one particularly shadowy, reveals in the final paragraphs. "She didn't see anything important, but we plan on keeping an eye on her anyway." 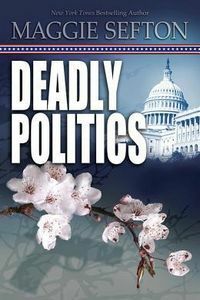 Special thanks to guest reviewer Betty of The Betz Review for contributing her review of Deadly Politics. Acknowledgment: Midnight Ink provided eARC of Deadly Politics for this review. Location(s) referenced in Deadly Politics: Washington D.C.